HDPE sunshade net has the characterisics of lightweight, high-strength, anti-aging, large-area coverage. Plastic shade net can be classified into several types according to its function and applications: Outside Shade Net, Inside Shade Net, Outside & Inside Two-in-One Shade. Width: 1m, 1.2m, 1.5m, 1.8m, 2m, 2.5m, 3m, 4m, 5m. Length 30m, 40m, 50m, 60m, 70m, 80m, 100m by requirements. Colours Green, Black, Dark green, Yellow, gray, Blue and white or by requirements. 100g Balcony Sun Shade Net Used In Preventing Burning Sun. 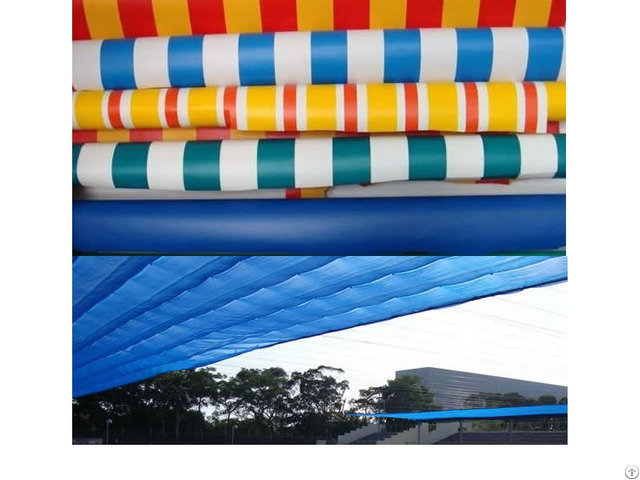 PVC Fireproof Blue UV Resistant Sun Shade Net In Rolls 360g. Sunshade net systems (shade, heat retention, or blackout curtains) reduce heat loss by reducing the air volume needed to be heated, creating an attic in the greenhouse for an insulative air barrier, and reducing the stratification of heat energy up to the roof. During the summer months the plastic sunshade screens can be deployed over the crop, returning temperatures back to an optimum growing range. Business Description: We are a Chinese factory manufacturing and exporting shade netting series products for agricultural and construction shading uses. We manufacture and export agricultural covering shade net,sun shade net,windbreaking geenhouse shade net,wind proof dust control net,fire resistant debris netting for scaffolding shade,plastic and polyester knitted shade,hdpe warp knit bird control shade netting,virgin hdpe waterproof shade netting. Our sun shade net is made in round and flat knitted monofilament mesh fabrics, offering dust-protection, anti-wind, durable uses and other features. Our main products available include: Agricultural shade net, sun shade net, wind break net, bird netting, debris safety scaffold netting, shade mesh fabric and greenhouse shadenet. Our staff is experiences in handling plastic material and mesh knitting. We use quality raw materials, under careful quality control process and offer only quality finished products with standard test certificate. We are proud to have exported our products to Japan, Europe, Middle East and other countries.We welcome custom order and coming samples.